Set in the world of Selenoth just prior to the events of A Throne of Bones, A Magic Broken is a fantastic tale of ruthlessness, courage and deceit. The novella tells the story of Captain Nicolas du Mere, an exile fleeing the death of his rebel lord, and Lodi, son of Dunmorin, a brave dwarf seeking to rescue his fellow dwarves from slavery. Their dangerous paths meet, but in a manner that is anything but predictable. It also introduces a second perspective character from A Throne of Bones. 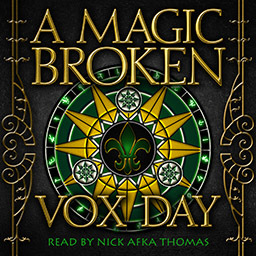 Read by Nick Afka Thomas, A Magic Broken is 105 minutes long. MP3 format. 40.1MB. No DRM.